I'd like to put in a plug for Bill at Up North Aviation. I had him cut my panel and he did a great job. I contacted him via email on Christmas Eve thinking that I'd hear from him within two days. Instead, I heard from him in less than two hours. Although we had some problems translating my Illustrator file to a format he could read, he worked on Christmas Day even to get it right. I was amazed at how quickly it all came together. I shipped him my panel, he cut it on Monday of this week and I got it back the next day...wow. Very easy to work with and for what you get, very affordable. Highly recommended! 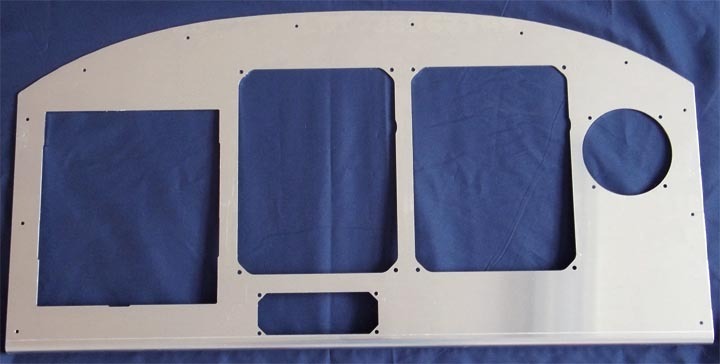 "For anyone looking for a perfect cutout of the panel for your homebuilt project you are working on, I can't emphasis enough how awesome Bill is to work with! Bill takes what you want, modifies the autocad drawing until you are satisfied before he makes the final cut. I couldn't be happier with the cutout and how easy it is to work with Bill...top shelf folks!" I recently bought an RV-8 and want to update the panel. After deciding what I wanted to do, I found it would be better to cut a new panel than try to make the old one work. I got a quote from a local avionics shop and almost cancelled the upgrade. After talking to an A&P friend, we've decided to do it ourselves. The first step was to decide exactly what layout I wanted. The next step was to get a panel and get it cut. I found here on VAF reference to Bill at Up North Aviation and dropped him an email about my project. He has been a joy to deal with, from helping me acquire a panel blank to making good suggestions about the layout to doing a great job of cutting the panel and getting it to me many states away. If the rest of the project goes as well as dealing with Bill went, I got no problems (fat chance, huh?) I just wanted to share a good experience. My panel was designed and cut by Bill at Up North Aviation. Once I decided on my panel instruments I got some advice from Bill at Up North Aviation who helped me design and cut my panel. Up North Aviation was fast and efficient, was great help to fit everything in all dimensions, and once I received my panel everything fit without any problems. Was a pleasure to work with Bill and would do it again. "Bill was a pleasure to deal with, and does really first-rate work. He patiently worked through multiple iterations of my panel drawing (due to various small errors on my part), and created CAD drawing using the dimensions I supplied. I then had the panel blank shipping directly to him from Van's, which Bill cut and shipped to me within a day or so of his receiving it. The quality of the result was perfect so far as I can determine. I would gladly use him again." "Thanks for the good work in designing and cutting the new panel for my RV-8. You did a fine job of helping me incorporate most of my existing panel gauges while adding a Grand Rapids Sport with 8.4" screen. The finished product will look outstanding. You did a good job of laying it out with your CAD program, particularly on the left side where there are some really tight clearances. There are some braces behind the panel of an RV-8 that must be worked around -- you handled it. I liked being able to go to Kinkos and print out a full-size drawing to think about prior to you actually cutting the aluminum. The panel as you sent it requires a very minimum of dressing up prior to paint. Thanks again. I would recommend your services to any other aircraft owner." 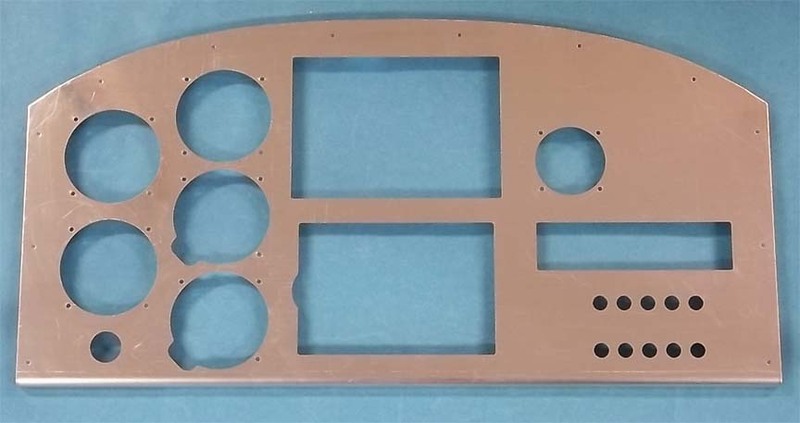 "I recently engaged Mr. Morelli for help with the construction of the cutouts for my RV-8 center section instrument panel and could not have been more pleased. His suggestions during the layout phase were both timely and accurate. He discovered errors in my AutoCAD layout that were due to inaccuracies in the base drawing furnished by Van's (it's 1" longer in their drawing than in real life) and suggested that several radios be relocated due to possible interference issues with Z channel braces behind the panel. Either of these errors would have been major problems, and might not have been discovered until metal had been cut or installation started. A trial fit of the instruments into the finished product has been perfect and workmanship appears to be excellent. I'll use him again. Highly recommended." I was exceptionally pleased with Bill's work. I had searched out a CAD program to send him details. That was a waste of my time. Bill has all of the instrument footprints. I sent a sketch of what I was trying to accomplish and he sent a remarkably good first cut drawing back to me in hours. We exchanged emails and drafts until it was "Perfect". Still, I changed things and Bill found other issues. When I actually got the panel, it was anti-climactic: the physical panel looks exactly like I expected.